EGONOIR : " Die Saga"
Actually EgoNoir would have a tidy introduction earned, since I know more than the country of origin however about this project hardly, I willy-nilly directly on the secondary work on behalf of “the Saga” will fall themselves. On this 40minütigen album one approximately presents a very personal interpretation of Black Metal, which moves logically a small piece apart all too withdrawn paths to the public. The basis of the music is naturally BM, in this case black metal of the raw, atmospheric sort, unterschwellig melodic, particularly into slow to intermediate Gefilden at home and only rarely into rage purging. The singing failed very variously, it lends to the music with its repertoire distorted a Gekrei very characteristic note by Recitation up to. But the presentations of the singer are not the only point, which lets EgoNoir profile win. Beside classical tendency producers such as Samples or acoustic guitars one avails oneself also various category-atypical electronic Spielereien and sounds. That will already deter some conservative listeners on principle, pleases me however as much alternation exceptionally rather well, nevertheless never comes the pieces to pseudo avant-garde patchwork. On the contrary, the individual, often opposite elements merge into tendency, skilfully arranged compositions, which remain obligated always for the spirit of the BM despite all digressions. After as much Lobhudelei it is permitted me to attach also a small little criticism. Too I see myself compelled to these, since the fortunately rare faster sections want to taste not quite to me. Thus for example the something suffers otherwise very interesting “only new chains” from these outbreaks, if little exciting of reef does not provide necessarily for high tendency. Also the normally very manierliche Plastetrommler loses custom and behaviour, if it must work somewhat more. But I lost already super proportionally many words over this detail. Fact remains that EgoNoir a relatively original, very atmospheric album succeeded, to which I can give eight points with good conscience. Simply times “if the new nature” or the far away at Manes reminding “a war hears you beyond the worldliness” on, then you will see that these are well-deserved. It's been more than 3 years since we last heard from depressive German black metal weirdos EgoNoir, whose sound was equal part classic black buzz, and mournful moody melancholia. They have a new record that just came out, which we'll have soon, but this one is almost as exciting, a reissue of their 2004 demo Die Saga, recorded three years before their debut full length Der Pfad Zum Fluss, and if anything it's even more warped and twisted, more muted and murky and fucked up and freaked out. The same equation still applies, but the sound is so much more raw, the buzz thick, the distortion crumbling, the vocals doused in FX, all beneath a sheet of static and hiss, a lurching doomy plod, black metal riffage slowed down to a crawl, clean guitar filigree wrapped around croaked monstrous whispered vocals, the drums weirdly processed and effected, the guitars melty and lysergic, the fuzzed out drone an oozing black cloud, strange keyboards wheeze and shimmer, trumpets bleat and moan, strings soar beneath the roiling blackness, bits of electronics, weird glitch and grit, all add to the obscure moodiness. 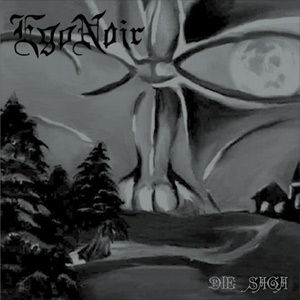 Much of the record is spent stripped down and melancholy, weirdly mournful interludes with lush guitar strum, simple skeletal percussion, whispered vox, strange rhythmic thumps, haunting hushed ambience, but those interludes are constantly swallowed up by blasts of grinding black blast, or weirdly synth driven blackened new wave hypnorock, or mysterious choral drifts, awesome and totally demented. The reissue includes a bonus track, a gloriously and insanely murky chunk of midtempo Burzumic blackness, that's SO muddy and muted, it practically makes Xasthur sound hi-fi, and turns some black metal into something much more blurred and washed out and trippy. So rad.